The Good Luck Duck: Just another Buick in the wall. Just another Buick in the wall. You don't need no education! You might get some contact learning, though, so keep your Benadryl handy. 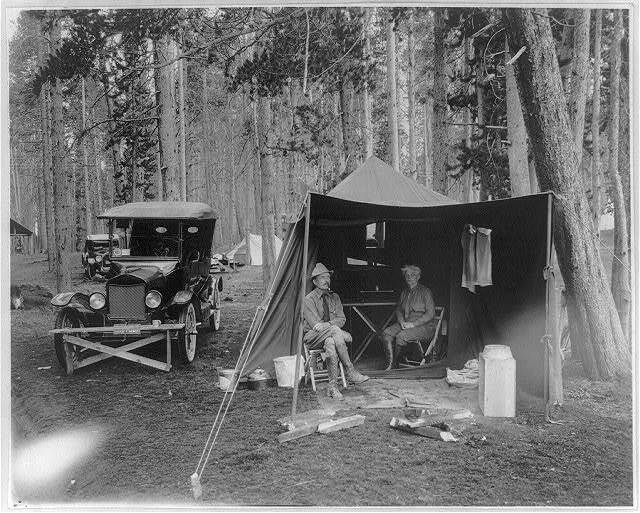 Car camping got popular in the 1920s, when people needed vacations, but couldn't bear to leave their Fords in Dodge. 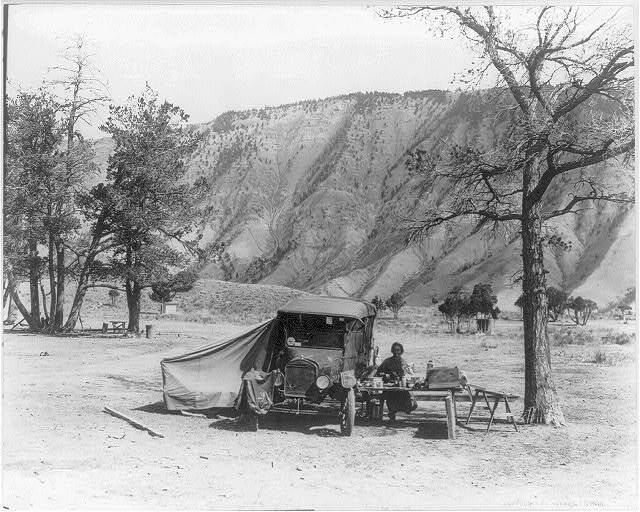 These folks were the pioneers of car-campers. The Rough Riders of roughing it. Their smartphones have dead batteries, but look at the fun they're having! Somebody back East is saying, "Why don't they write?" In 1919, there was a caravan of 50 cars, even one built to refrigerate food (still not answering that one pulsing, unsilenceable question*). This article is rekindling the glowing embers of my interest in boondocking in Spud. I'm just in no hurry. I'm comfortable, contemplative, content, and continent. You'll offer me good, sturdy answers. These answers will work in a car (not a van), with people possibly in the vicinity, without benefit of vault toilets. An interesting history thanks for the links. Check and see how Suanne does it. I think Bob made a video of her layout and arrangement (not the act itself)... and if she can do it, you can do it. "Somebody back east..." My favorite line of the whole movie! Before he gained fame as Eldon in Murphy Brown. And what's wrong with vault toilets? I use them all the time, and I have my own poop deck! Nothing! I'm a big fan. They just don't always exist where I want to be. Short of a bucket with sawdust and a seat I've got nuthin' :-( Love these old pics, although the burning question for me was "Why are you wearing a tie?!" I couldn't help it, Nickie. This stuff writes itself. Jodee, that would be just fine, aside from the privacy issues. You're right, Swankie, and that's a fine idea. Back in the day, Suanne was just staying at places with ac-commode-ations, but I'd love to see what she's up to now. I think I remember reading about "catholes" being acceptable on one of the State or Federal Forest websites as long as done properly. I think you're right, and I'll check out that article. I'm happy to do that if I'm really and truly alone; the discomfort arises when there are other campers in the area. You will find in the right-hand column she has quick links to how she handles each type of function so there is one on "Bathing, Brushing, Bathroom." I have plenty of room in my van for a hassock type (a comfier version of the bucket), but for some extra space for showers (with my weed sprayer or sun shower), I use a pop-up privacy tent. Mine is a large and sturdy one but even that one does that magical self-folding thing and become a big, FLAT circle so it is pretty easy to store. Mine has pockets along the ground so you can put some rocks or whatever in the pocket to hold it down. Seems like you could use something like that for an extra "room" should you want something more than the type of short bucket Suanne uses. Boondocking is the best in my book, so I hope you work out something suitable for yourself! Dang it... scrolled back up after posting and I see YOU have Suanne on your blog roll!! OH well, you don't need my link but maybe directions to her quick link for the bathroom how-to will be helpful. Quacking up here. You know, I had previously discounted the "room" idea, but now it sounds very doo-able (*snort*). Many thanks for that! Ummm, yuh know, there's a REASON yoga's become popular. Of course no one's *talking* about it, but aside from the quiet facilitation of an enthusiastic YES!! to the timeless question "Did everything come out okay?" it enables the practitioner to adopt positions conducive to tight-quarters defecation (TQD). Now, pay attention (this is assuming you've now had 3 years of yoga, AT LEAST 3x/week)....First obtain several washable incontinence pads such as those from Northshore Champion. After covering the area with the pads take a 13-gallon, TALL kitchen garbage bag and open it. Assume the position -- whichever suits your mood -- and with the bag opening fully embracing your backside...let fly. A pre-event enema can sometimes be helpful in cases where peanut-butter-esque texture is common. Cleanup is as per usual. Close bag and place in as many heavy-duty ziplocks as necessary to contain smell....usually three or four. In all my seven years I've had to use the method once. It worked fine, but I was slimmer then...and younger. Still, it WAS in Eggbert. I wish I'd taken a vid; I'm sure it'd have become a cult classic. Mike's comment may be the most "excitement" this blog has seen in a duck's age. Heaven's Gate - You think THAT's scary....wait 'til you read my comment on YOUR blog. Loving the exchanges, here and everywhere. So timely!! I've been wandering the slickrock the last week where there's not a scrap of dirt, let alone enough for a cat-hole. The method works great! Thanks for the reminder. Oh, and don't forget to roll the top of the bag down some; it provides leeway for the "transition."